It was freezing cold when I was on my way to Liguria from Turin. I was traveling with my friends and even though we had breakfast, we felt hungry as soon as we reached Ormea. Ristorante Italia had such a typical Italian vibe- full of locals and travelers stopping in from Liguria and Piemonte. It was also a wonderful stop for eating Piemontese delicacies such as Bonet (typical chocolate cake), Cugna (a sort of jam made with fruits, hazelnuts and walnuts) and Carpione (a type of vinegar and wine mixture from Piemonte and Lombardia). The food was mind blowing and the service fantastically Italian 😉 The Bonet was probably my favorite and made me left wanting more. After the heavy lunch, my friends and I took a walk along Ormea and realized there was really no one around even then! 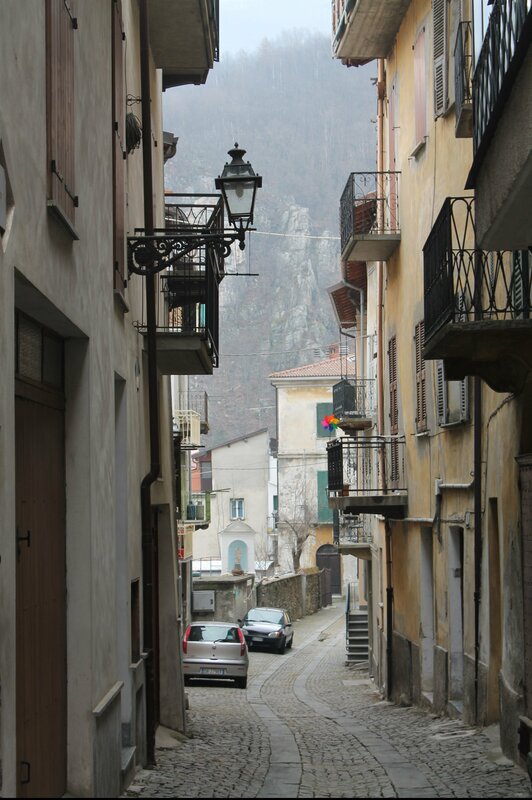 It was a very dull winter afternoon but I am happy I had one of the best lunches in Piemonte. Ristorante Italia also has a Hotel by the same name and offers modern services like any other hotel. It would be amazing to stay here for a few days and explore the mountains of Piemonte. Anyhow, after a fulfilling lunch, I reached my friend’s home in San Bartolomeo al mare just in time to see a beautiful sunset. The food looks amazing!! Italy is wonderful even when it is cold. Carpione per se does not mean much. It is a marinade. I’m curious to know what you ate “in carpione”. My favorite – between the sea & mountains! I am curious to try Bonet…you know I’m a fanatic for anything chocolate! I am also curious…where does everyone go in the winter?? Are they just all indoors?? Or just a small population? Thanks Lorelle. It has great hiking spots too.